A new addition at the San Ysidro Port of Entry opens Monday to give pedestrians more options when traveling southbound. 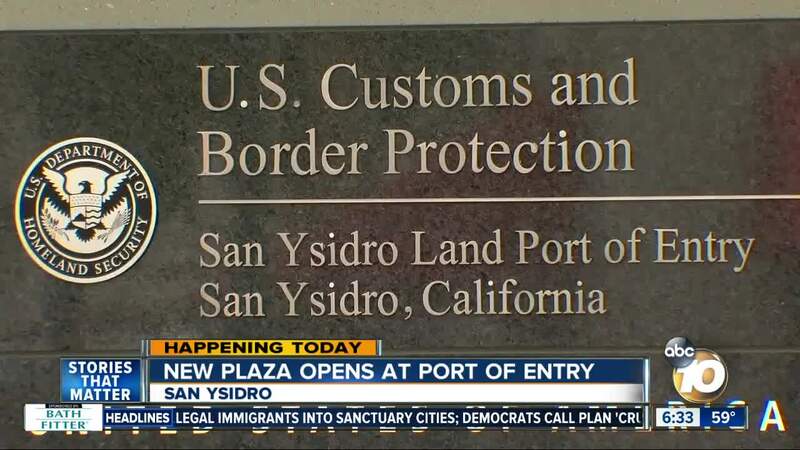 SAN DIEGO (KGTV) - A new pedestrian plaza opened at the San Ysidro Port of Entry Monday, giving travelers heading into Mexico another option when heading southbound on foot. The plaza, located southeast of the pedestrian processing (PedEast) facility and just south of the MTS trolley station, is part of a $741 million plan to expand and modernize the Port of Entry. Travelers will still be able to head southbound for crossing into Mexico through PedWest, which is located on the port’s west side near the MTS Virginia Avenue Transit Center, the U.S. General Services Administration said. Last August, the PedEast facility opened to the public, adding 22 new pedestrian processing booths to help speed up the customs intake process. The third phase of the project, expected to be completed this winter, will include new Interstate 5 northbound and southbound inspection facilities.